STEM THEMES: All. STEM women. 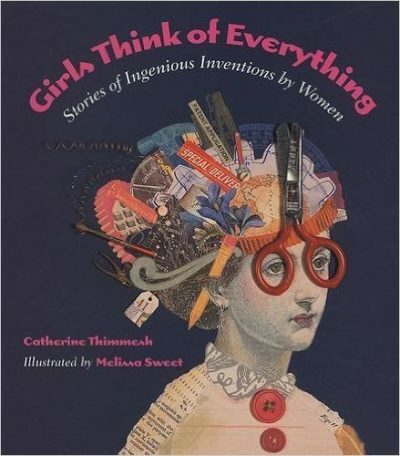 OVERVIEW: This book is a great starting point to introduce children to some of the incredible contributions that women have made to STEM subjects. DESCRIPTION FROM THE PUBLISHER: In kitchens and living rooms, in garages and labs and basements, even in converted chicken coops, women and girls have invented ingenious innovations that have made our lives simpler and better. Their creations are some of the most enduring (the windshield wiper) and best loved (the chocolate chip cookie). What inspired these women, and just how did they turn their ideas into realities? Features women inventors Ruth Wakefield, Mary Anderson, Stephanie Kwolek, Bette Nesmith Graham, Patsy O. Sherman, Ann Moore, Grace Murray Hopper, Margaret E. Knight, Jeanne Lee Crews, and Valerie L. Thomas, as well as young inventors ten-year-old Becky Schroeder and eleven-year-old Alexia Abernathy. Illustrated in vibrant collage by Caldecott Honor artist Melissa Sweet.